<br>We have seen many SRPGs in our time. Some were extraordinary and somewere not so great. 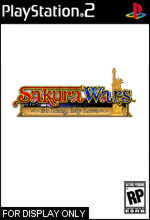 Though most SRPGs make you grind through their battlesystem to power up your characters, Sakura Wars revolutionizes this bycombining Sim elements into the SRPG. No longer shall the game dictatewhat the player should experience. Instead, Sakura Wars allows the playerto choose their own destiny. The player's human interactions affect thestory and power up the characters.